The other night, at Kroger, I looked down at the paper bag in my cart and I felt a little horrified. In the bag were two packages of Oscar Mayer Bologna, two loaves of white bread, a head of iceberg lettuce and a package of hot dog buns. So it has come to this, I thought, panic creeping in. Rather than teeter off the edge into full-blown despair, I rationalized. This is the price of my freedom. Even though my husband is retired and I find work here and there, job-writing, I don’t have to punch a clock anywhere. If I was out there in the rat race, I could buy what I used to buy. But at what cost, I asked myself, just slightly smug. It’s been bologna sandwiches for three days now. And truth be told I have a sort of “slumming it” fondness for such food. Sometimes a bologna sandwich on squishy white bread is just what the doctor ordered. But not often. And certainly not for three days in a row. It seems worse in the summer somehow. In the winter, you can spin fantastic meals out of the meager pantry. A bit of bacon and some dried fettucine, a little cream and before long, it’s a plate of fettucine carbonara that you’re tucking into. Potato soup. Clam chowder. Casseroles. My one indulgence is the quart of heavy cream because it does extend everything into the realm of sublime. I know how to cook and for the most part, we eat well. But I’m not inspired. 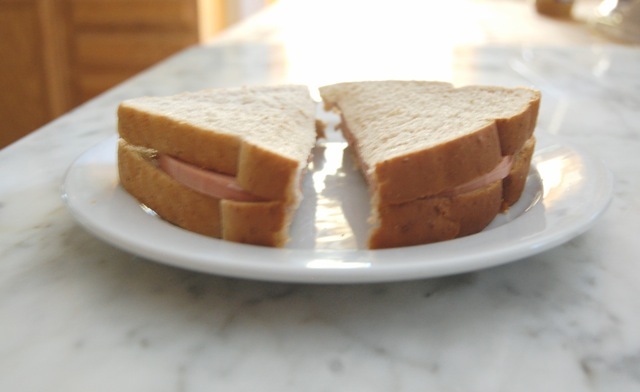 There are things that I could make, even now in the sultry days and nights of this Ohio summer, that are tasty and sustaining and don’t seem quite so pathetic as bologna sandwich on white bread. But I don’t. I just open the refrigerator door and reach for the mayonnaise. I think the problem is my husband. Tonight he wanted to go see a free jazz concert that the Dayton Philharmonic was playing at a venue just across town. He didn’t go because he didn’t feel we could afford the gas to drive 10 miles. Maybe he’s right. The thing is it doesn’t matter if he’s right or not; that “sky is falling” outlook is persistent and contagious. It’s true that there’s a lot of month left to go with $100 in the bank. But ever the grasshopper, I think there will be some solution around the corner, and there generally is. But he’s right, too. What if there isn’t? I don’t want to be so poor that we can’t drive 10 miles. That level of austerity chips away at my sense of freedom. Even to continue the research for the book, I’d have to drive out to the University. Eight miles. There’s a bus, but that’s too expensive as well. So I go on eating bologna sandwiches. Which is, in itself, ridiculous. Friends gave us fresh asparagus last week, it was delicious. The cherry tree in the yard is heavy with ripening fruit. There are still cartons of my favorite yogurt in the fridge. A pork roast in the freezer. Potatoes, always useful in salads. We should have planted a garden- I wonder if we still couldn’t get a few things in the ground. Eggs, of course, lend themselves to a thousand guises. The white bread is the biggest sin of all since one of our best friends is an artisanal baker, and we could simply ask him. But asking is hard. The concern that I will ask too much never leaves me. There are 17,908,343 “food insecure” households in the country. That’s not people. That’s households. Using the U.S. Census bureau statistic of 2.55 individuals per average households, this figure represents 45,666,175 hungry people. Or about the population of California– all wondering where there next meal is coming from. We don’t even really meet the threshold for “food insecurity.” We certainly have too much money and too many assets to ever qualify for Food Stamps. Think about that the next time you’re judging someone using food stamps to buy a birthday cake or soft drinks in the check out line in front of you. Isn’t it bad enough to be hungry much of the time, do they deserve scorn too? The rate of food insecurity changes by household type: more than twenty percent of households with children don’t have enough to eat. Our household falls into a kind of gray area that the U.S. Government calls “marginal food security.” That means we worry that we’ll run out of food before we have more money. That we consume food faster than we thought we would. (Well, hell, there’s a 19-year-old boy-man here, of course we do.) That our diet is not as varied as it should be because of our very limited food budget. So. I’ve decided to trade off a little of this bountiful freedom for a bit of precious security. I am going to see if I can’t find very part-time work; 10 hours a week would make a difference. I probably waste that much time noodling around on the internet. And if I can’t find something, I’m going to make Chicken Little look for a bit of work. He’s earned his retirement, certainly, but without work, his world has become quite small. And tomorrow I’m going out to lunch with a friend. ← We All Shine On. Oh Martha, many thanks. Looking forward to more religious festivals. At least they’re free! Beautifully, humbly and thoughtfully written. Thank you. What a kindness. Many thanks to you. Love the story Larkin. Things are changing here too with me heading toward disability I am considering food stamps to help us out a bit. This prospect makes me feel guilty and ashamed but it seems necessary now. I’m so sorry about the disability, though I hope it will make it easier to get more assistance. I was shocked how high the thresholds are to get help. Don’t feel guilty or ashamed, think of all the years you contributed to it. Now it is your turn to be helped. When you think about the rapacious waste in Washington, help to keep from being hungry seems like little enough they can do. Sending love. Thank you for sharing this story Larkin. This is a subject that is very important to me for many reasons. So many of us living this reality. I hate the prettified terms ‘they’ come up with to try to dismiss this reality, such as ‘food insecure households.’ ‘They’ like to keep the talk focused on how people in poverty need to learn to manage better, give up their expensive luxuries, learn to live within their means, just get cheaper apartment, the ordinary common sense things many sensible frugal people already do. So little about the self-esteem and soul-crushing psychological and emotional trauma. Loss of social life, when you can’t afford to do ordinary things with friends, like ‘do lunch’ or outings, you drift part, relationships not nurtured with togetherness fade. The fear, not only of running out of food before the month is up, but of any and every kind of pending disaster hanging over your head, what if, what if, the car needs a repair? the refrigerator goes out? An unexpectedly higher than usual utility bill. And rubbing salt into the wounds, the scorn, ever the absurd and delusional popular belief that those with low income really live better than ‘the hard working people’ on all those generous government handouts that they have blown up in their minds into outrageous amounts. You are so right. So completely and utterly right. When did Americans become so selfish and so lacking in compassion?